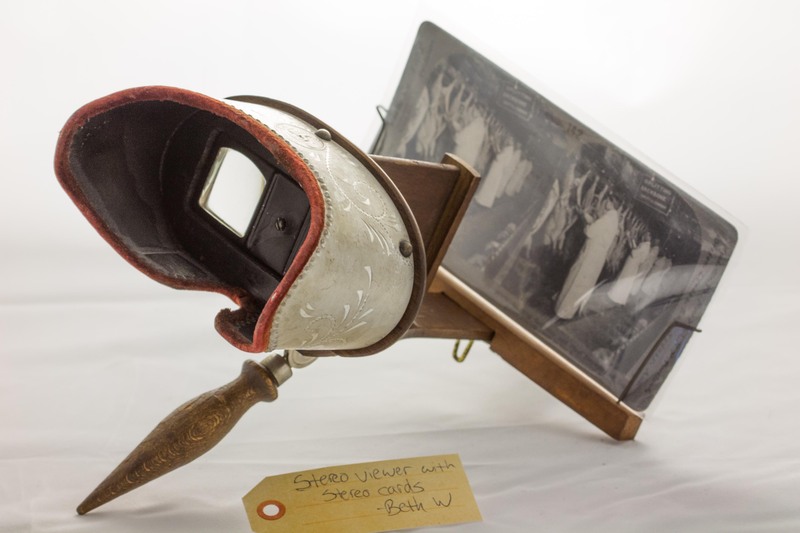 Stereo viewer with stereo cards | That Belongs in a Museum! These stereo cards and accompanying Holmes stereoscope represent cutting-edge technology…for 1861. Today, they are pretty much obsolete, displaced by the motion pictures and television. Many years ago some version of this device, which allows a person to see the two pictures on the card as one three-dimensional image, could be found in most upper- and middle-class homes, while people who couldn’t afford such luxury viewed stereographs at penny arcades. They were nearly ubiquitous. Now, stereograph enthusiasts like myself must go to special exhibitions, dig through flea markets and antiques shop stalls, or even obtain a dealer. My personal collection of stereo cards includes many Chicago-related images, including some from the 1893 World’s Columbian Exposition, aka The Chicago World’s Fair. A few of the captions relay a little bit of the pride and snark that came after being chosen over New York for the fair. Written and exhibited by Beth W.